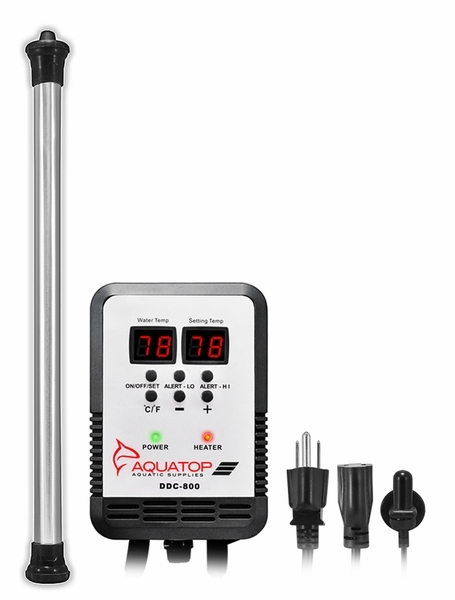 Aquatop's DDC-800 Digital Controller/TH-1000W Titanium Heater Combo offers precise control to ensure stable water temperatures for all aquatic livestock. With a highly visible dual digital LED display, the DDC-800 includes adjustable high and low temperature settings with audio alerts. This advanced controller utilizes heavy-duty, three-prong receptacles and offers overheating protection. Each unit is equipped with a dual relay interwork that doubles the protection and safety of aquatic life by disabling the heating element in case of overheating. This highly accurate digital controller eliminates temperature fluctuations and is the perfect addition for saltwater and freshwater systems. AquaTop�s TH Series of titanium heaters are corrosion resistant and virtually unbreakable. The corrosion-resistant construct adds to the longevity of the heater by protecting it from damage, especially from saltwater. These titanium heaters are built to last and are effectively indestructible when compared to standard glass aquarium heaters. The heating element provides stable temperatures for aquatic creatures and eliminates harmful temperature swings. Well suited for both fresh and saltwater aquariums, the TH Series of titanium heaters can be used with AquaTop�s DDC-800 digital controller for the ultimate temperature control.